Local historians Phil Jones and John Noack will present the first talk for Heidelberg Historical Societyopens a new window's meetings calendar for 2019. The Society will meet Tuesday 12 February at 8 pm at the Uniting Church Hall, Ivanhoe. 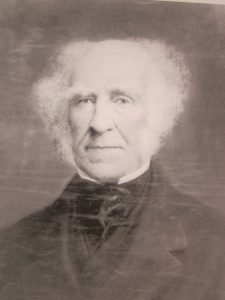 Captain Sylvester Brown was one of Heidelberg’s first settlers. This talk will present the triumphs and tragedies of Captain Brown of Hartlands. He began to purchase land in what is now Eaglemont from 1838 on wards and soon owned 313 acres. He also purchased land in Toorak, and a large holding in Northcote in addition to various blocks of land in what is now the City of Melbourne. By 1840, he was ready to bring his family to Heidelberg, so he built his home at 543 The Boulevard on his Hartlands Estate for his wife and family, which included the later very famous author Rolf Boldrewood, who wrote Robbery Under Arms. Phil Jones has been a long-time resident of Heidelberg, who lived on this same property. He has been a keen researcher into the Brown Family and he has compiled a very informative and interesting history of this Family. John has been able to locate other sources of information including original letters, diaries and biographies from the State Library Victoria and this talk is the result of these years of shared-research. Captain Brown’s life before Heidelberg featured an adventurous life of triumphs as a confident and capable Sea Captain of various large vessels but after he settled in Heidelberg, financial tragedy struck during the mid-1840s depression and he never recovered. He rests in an unmarked grave at Melbourne General Cemetery.